Lock-Tech is continuing its successful partnership with building contractor Willmott-Dixon with its involvement at Aberystwyth University on the new world-renowned IBERS (Institute of Biological, Environmental and Rural Sciences) facilities at Penglais and Plas Gogerddan campuses. The new developments will house world-class resources to help find solutions to the major global challenges of food, water and energy security, and adapting to changing climate. The two developments are closely aligned and as a result, the intended integration enhances both the education and learning for the University and its students across the campuses. A central requirement for both project briefs was to design an architecture driven by low energy and sustainable design principles to reflect the nature of the scientific research and the University’s commitment to reduce greenhouse gas emissions. The projects are accredited as BREEAM ‘Excellent’ and have won BRE national sustainable design awards. Lock-Tech was responsible for the supply, installation and the final commissioning of the SALTO access control system. Working closely with the University and Willmott-Dixon, we installed a range of different door solutions to satisfy the broad requirements of the various teaching facilities, laboratories and public spaces that the buildings incorporate. Our advice and expertise on the range of access control technologies being used was also instrumental in achieving the successful integration of the various systems. With the installation of the SALTO access control system the University does not have the worry and cost of managing keys, or changing lock cylinders, but can now update, restrict or deny access to any lock remotely. This gives unmatched flexibility and a secure yet accessible site for the staff and students whilst also allowing visitors controlled access as required. The SALTO Virtual Network (SVN) system combines quality engineered door security hardware and robust database-driven software to manage users and access points with a minimum of fuss. User information is stored on each person’s card or fob relating to which doors they are permitted access to and the times within which they are allowed to do so. Whenever a card is used (simply by presenting the card to the wall reader or door escutcheon for a moment) the recorded data on the card is compared with the data stored on the door control unit and if the user is permitted access then the door will activate. Furthermore, online update points connected to the University’s ethernet network can update the information on a user card to the latest information. Door use can also be monitored and doors can be set to open in certain time periods or any one of several alternative functions. The SVN set-up also stores important blacklisting information for the whole system on every card, meaning that all doors on the system are updated by every card that is used to access them. Lock-Tech looks forward to continuing to work with Willmott-Dixon on future projects and also to working with Aberystwyth University as they look to maintain their existing access control systems and expand where required. Lock-Tech has been an official SALTO business partner since SALTO first began trading in the UK and take pride in supplying the market leading access control technology in the UK market place. Furthermore, Lock-Tech are now officially a SALTO Certificated Partner. 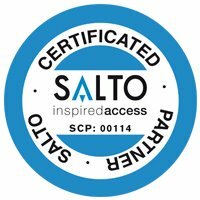 SALTO Certificated Partners are trained and annually licensed to the highest achievable level by SALTO and are able to advise, consult, survey, supply, configure and install the full SALTO stand alone wire free and wireless product range.